Smartphones have practically taken over the world. From obsessively texting to checking Facebook over and over again, people are spending more time than ever on their phones. Many people aren’t even firing up their laptops anymore. Instead, they use their phones every time they surf the web. That means mobile marketing is more important than ever before. Let’s take a look at some mobile marketing statistics, and then go over some simple ways you can get into the game. 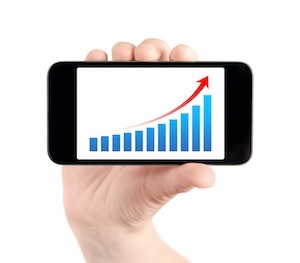 While anyone can say “mobile marketing is a big deal,” statistics don’t lie. In a study that was conducted by comScore on behalf of PayPal, it was discovered that half of the people who own a smartphone have made a purchase on it. That number is even bigger for tablet owners, with 62% having made at least one purchase. On top of that, 90% of online shopping occurs at home, with 33% of that activity coming from smartphones. This data shows why mobile marketing is so important for businesses of all sizes. The question is, then, how do you begin your mobile marketing campaign as painlessly as possible? Making your site mobile friendly is one of the easiest ways to take advantage of mobile marketing. Once your site is optimized for mobile devices, people will be able to access your online storefront and make purchases right from their mobile phones. Your mobile site needs to be designed so the most important information is front and center. That’s because mobile users don’t want to have to go through a series of clicks to get what they want. It also needs to be fast, since most mobile users won’t put up with long load times. Once your website is ready, you will enjoy some benefits. Your mobile site will likely rank higher than sites that aren’t mobile friendly. That means you will have an edge over your competitors who haven’t created mobile sites yet. This is really important, especially since more and more people are using mobile devices to make purchases. By the time your competitors finally come around and make their own sites mobile friendly, you will already be way ahead. Your site will also be ready to bring in traffic from a mobile advertising campaign. Thus, you will be able to set up a pay-per-click campaign to run on mobile devices. People who click on your ads will go to the mobile version of your website, where they can find out more information and make a purchase. This will help you drive a lot more traffic to your site and boost your sales. Your mobile website will also make it easier for people to contact you. You can actually link your phone number on your website. Then, people will be able to click on the phone number and their phones will automatically call your business. That means you will just be a touch away from your customers. This will make it much easier for people to contact you to ask questions or to order your services over the phone. Mobile marketing has opened up new doors for business. You don’t have to be tied to a computer or a mailbox. Instead, you can go with your customers as they drive in their cars, visit their friends or hang out at home. You’ll be right in their hands, ready to make a sale at any time.